Posted on July 28, 2015 July 29, 2015 . by Patrick Johnstone. Leave a comment. When the City decided to support our growing Pride Celebration week this year by painting a crosswalk with the rainbow symbol of Pride, the reaction was immediately positive. Aside from mentions in the local and alternative media, and a huge splash on social media, there was no big press rush or ribbon-cutting unveiling. It was a small but meaningful gesture, and we are far from the first community to do it. @MsNWimby and I decided to take walk by after dinner yesterday so she could see it for the first time, and I was at first buoyed, then dismayed, to see a small crowd gathered taking pictures. Yes, somebody had splashed some household paint on the crosswalk, and all of the sudden, the regional media was interested. I think it says something about where we are in Canada in 2015 that a City displaying an important symbol of inclusion, diversity, and acceptance is smaller news than someone defacing that symbol. Some might use this to critique modern media’s tendency to tell us what is bad in the world instead of what is good. I prefer to look at it from a more positive side. The symbol of the Rainbow Flag was once a revolutionary one, born of the historic struggles for acceptance of homosexuality. The rainbow as a symbol of diversity and inclusion grew out of San Francisco as that City became the bulwark of “Gay rights” in the post-Hippie era. As is typical with symbols that challenge orthodoxy, many tried to ban it or belittle it. Fortunately, through the struggle of new generations of activists and community leaders, our society evolved, and the meaning of the flag has evolved with it. It is not just about “Gay rights”, or even homosexuality anymore; it is about recognizing that people are different. Colour, size, age, sexual orientation, gender identity, kinks – nobody is “normal”, because in a society of individuals there is no “normal”. Even I, as a hopelessly Wonderbread white, straight, monogamous, middle-aged, cis, professional male, exist within a spectrum. The rainbow flag reminds me that the privileges once bestowed only upon those within my narrow band of the rainbow must now be enjoyed by all, or we don’t live in a just world. Unfortunately, we do not yet live in that just world. The good news yesterday was that several people were around the crosswalk when the elderly vandal started slopping paint on it. They were quick to contact the NWPD, who were quick to react, and the gentleman was quite literally caught white-handed. A couple of quick phone calls, and City engineering staff were able to get a clean-up crew out there before the paint had fully dried, minimizing the damage. I’m really proud of our Police and Engineering staff for their quick response, such that by the time the first TV camera arrived on scene, the mess was already disappearing. In hindsight, that probably sounded angrier than I was, as mostly I felt disappointment. It was later I learned the vandal was an aged man whose faculties may not have been completely intact. There is no doubt the act was deliberate, and the man should have to pay restitution to the taxpayers who paid for the policing and clean-up, but I mostly felt sorry for the man who felt so desperate to remain in his own, narrow band of the Rainbow. I hope you all come out and enjoy New West Pride August 8-15th. It is going to be a great series of events, culminating in the Pride Street Party on Saturday the 15th. Get your picture taken with the crosswalk, and use it to start your own conversation. Posted on July 27, 2015 July 26, 2015 . by Patrick Johnstone. 7 Comments. I hate that word. Second only to my hatred for the term “jaywalking”. Both terms imply that there is a better use for a public space that you being on it, even if you are not actually stopping those better uses from being exercised. They are (semi-) legal ways of saying “go away kid, ya bother me”. 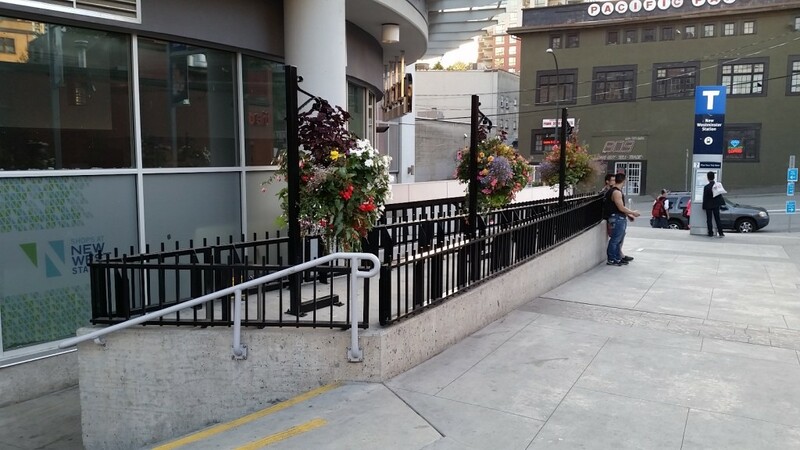 But I don’t want to defend loitering (a very, very good essay on that topic, with that very title, was already written by Emily Badger), I want to talk about a specific place in New Westminster, where we have completely lost the plot on loitering. The New Westminster SkyTrain station is the defacto heart of our City. Speak all you want about Queens Park, the Quayside Boardwalk or the Coffee Crossing in Uptown, I will argue that our central downtown transit hub is the centre of our new City. This is where compact, mixed-use, transit-oriented new urban development is centred. When Hyack Square was built to better connect it to the River Market, when hundreds of residential suites and thousands of square feet of retail were developed right on top of it, when the Anvil was conceived as a new community gathering space, it was all about the SkyTrain and New Westminster Station. It is the centre point in the “big vision” for New Westminster, and it is the new “front door” to our Downtown and waterfront, a mix of our Grand Central Station and our Times Square. As such, New Westminster station needs to be a space where people are comfortable hanging out, walking through, meeting friends, having chats. A place people want to be in, without a particular purpose, which is pretty much the definition of loitering. It has always been a little tough to love New Westminster Station. It is far better now than the empty parking lot ringed with marginal businesses it was in the late 80s when I first moved to New Westminster, but for the best part of the last decade, it has been a station under construction. Plaza88 / The Shops at New Westminster Station has taken a bit of time to find its character, but is now mostly leased up with an interesting mix of businesses, and is attracting customers. The Kyoto Block (the empty lot between the shops and the Anvil Centre) is still an empty lot and a signficiant missing connection, but despite some dreams I may have had, I’m afraid they will never be realized now that it has been sold. With the Anvil construction just wrapped up and now a year-long construction project on the SkyTrain station, followed by potential expansion of the McInnes Overpass to occur with the River Sky development, and building of the 4th Plaza88 tower, there is more construction to come. 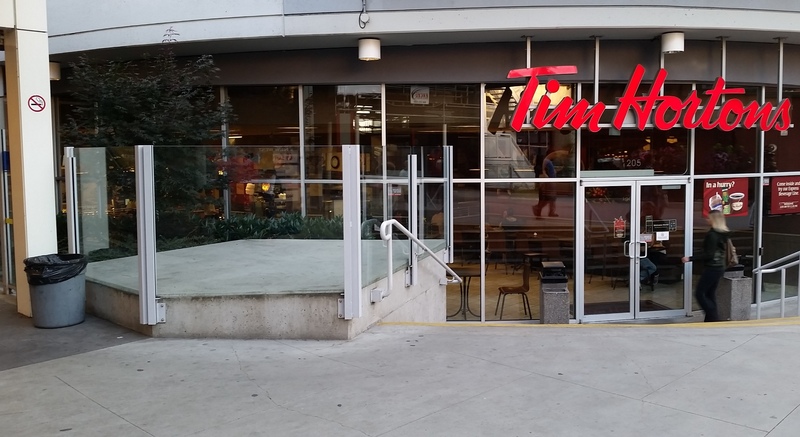 Meanwhile, the plaza opening up to Carnarvon between the front of a Tim Horton’s and the back of a Spaghetti Factory presents you the best-used “grant entrance” to New Westminster. With all due respect to the fine people in the Pawn Brokering industry – is this really the best we can do? However, it isn’t the walls around the space that we interact with as much as the space itself, and I have had two very different e-mail exchanges of late with New Westminster residents I respect about the “problem” with that plaza space. The interesting part is that they were two very different conversations. 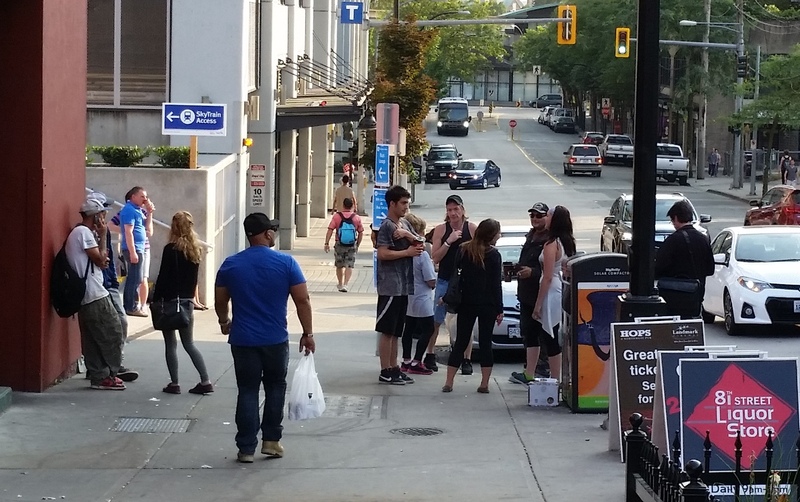 One complained about the loiterers and “gauntlet of smoke and dirty looks” they have to endure when walking through the station, the other spoke of all the unfriendly spikes and security presence that is making a presumptively public place less friendly for people to linger. I am very much on the side of the second person: public spaces with people in them are safer, more friendly, better for business, and more fun. It is clear the space in that plaza was initially intended to be lingered in – the architect built bench-height structures around the periphery and decks in front of the restaurants, there was even initially some funky plastic chaise-lounges and benches on the site when the shops opened. Now, the benches are gone. 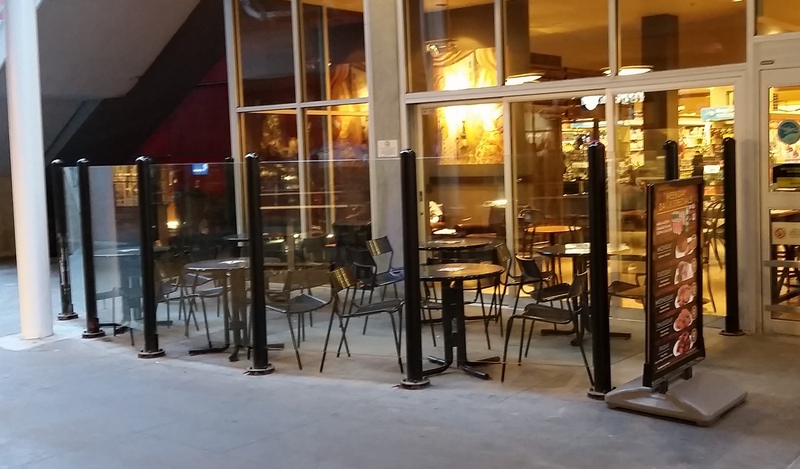 Metal fences have been installed to prevent sitting on one set of benches, glass wall installed ot prevent sitting on another. 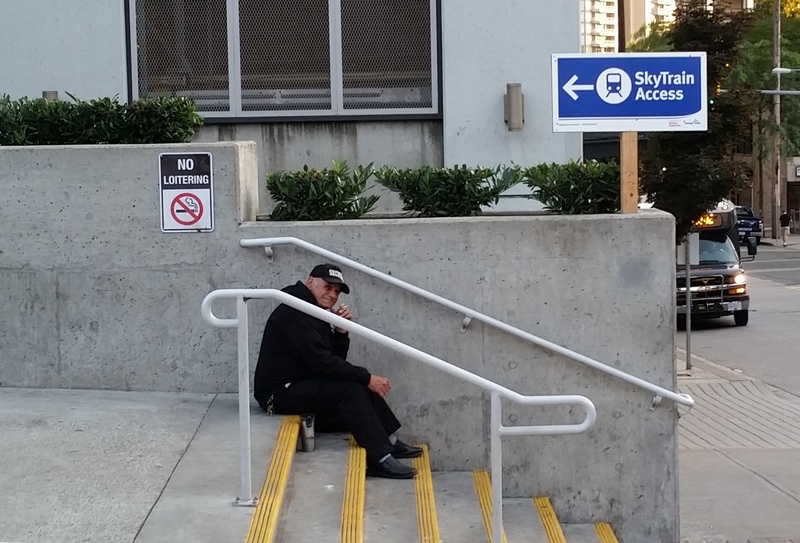 And in case you didn’t get the message, the ineffective No Smoking signs have been supplemented with No Loitering signs. This concrete bench is no longer a place to sit. Similar to this space, which was once somewhere you could sit. And the sign is there in case you don’t get the message from the spikey metal. Get away from me, kid, ya bother me. I remember a talk I heard last year by Susan Briggs, a prof at Douglas College, who discussed the loss of the public realm. We have replaced the town square with the shopping mall, the playground for the McDonalds Playspace, the urban space for the corporate place. Cash-strapped governments are only too happy to have private industry provide the plazas, the parks, the gathering spaces that governments cannot afford to buy, develop, or maintain. This space off Carnarvon is a prime example. It is the only access from the public street to public transit, yet the space is private, and beholden to the rules of the owner. In this case, the owner doesn’t want smoking teenagers and other ne’er-do-wells hanging about. Actually, I as I went down to the area yesterday to take a few photos for this blog, I was approached by one of thee young toughs. He was not very polite in asking who I thought I was taking pictures and suggesting I might prefer a punch in the face. He was clearly posturing more than threatening, but the demonstration was pretty clear that this space is not a friendly one for many people. I’m the first to admit I don’t know what to do about this. 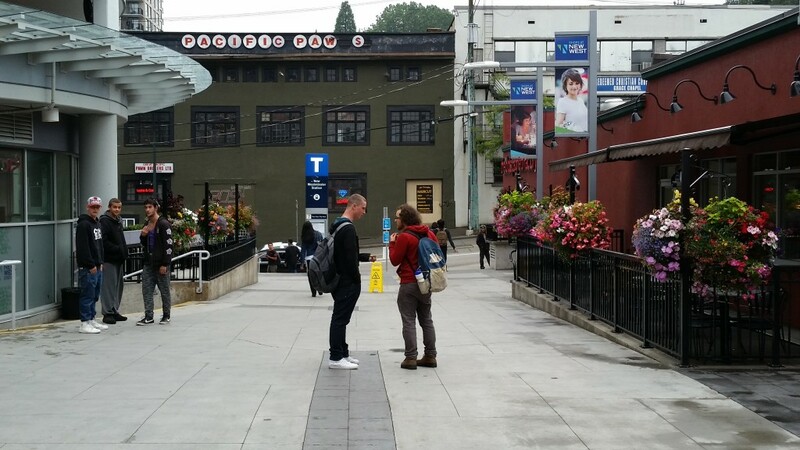 I want the entrance to New Westminster to be a welcoming space. But I have two suggestions, one in the control of the City, one not, and both successful in other cities. The first is soft community policing. I don’t want to be in a place where we send cops down there to bust skulls or push “the wrong people” (whoever decides what that means) out of public space in New Westminster. However, the presence of community policing officers downtown could make it a better place for everyone. Police on foot, talking to people, saying hello and just being present and visible without being threatening, can make a big difference to how people experience the space. But the balance is hard to find, and this approach needs to be very cautious around that balance. The second (and more promising) approach is to activate the space. The best way to make loitering (the pejorative term) into lingering is to give people a reason to linger, making the space “sticky”. This can include introducing some interactive public art, blending the restaurant seating space with the pedestrian space like you would recognize in the Spanish or French streetscape, or adding buskers or events into the space. The go-to reference for this type of urban space activation is Jan Gehl, and his writings about the “human spaces” between buildings. Nuggets of these ideas can be seen in the slightly half-hearted attempt of placing the chaise-lounges in the square when it originally opened. 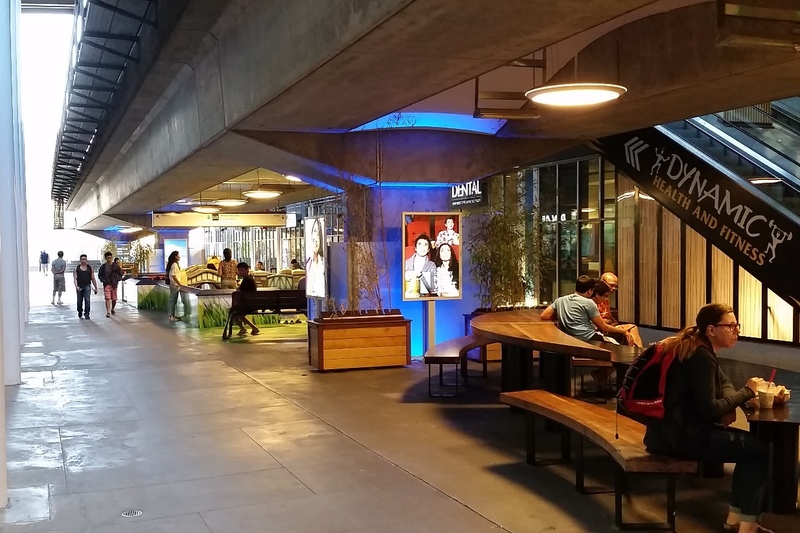 A surviving example is the kids’ play area under the SkyTrain in the middle of the plaza level of the Shops, which (despite the shadowy look and roaring trains) has managed to remain an inviting space. Unfortunately, the exact opposite of these ideas can be seen in front of the Safeway, where a “stickiness” opportunity is lost, and what could have been an active part of the public plaza became the best-defended coffee patio in history. What is the point of this glass wall? To keep people out, or in? 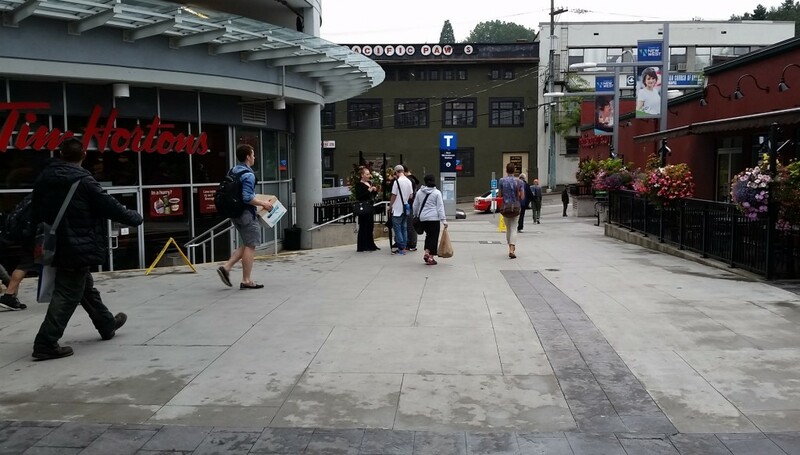 I’m not sure I know what type of “placemaking” can make this place more welcoming as an entrance to the City, but whatever it is, we will need to work with the owners of The Shops at New Westminster Station to make it work, because if it helps the City, it will help them as well. They need loitering for their businesses to be successful, and we want to be a City where people want to loiter. Posted on July 21, 2015 July 21, 2015 . by Patrick Johnstone. Leave a comment. I have been putting up boring council reports for so long, that I figure it is time to get back to a good old-fashioned NWimby-style rant here. It is about global warming, which I believe am convinced by the overwhelming scientific evidence is currently happening at a rate unprecedented in the last 2 million years, due directly to the accelerated introduction of fossil carbon into the atmosphere by human activities. If you are still in denial about this, you are either deluded or not paying attention, so before commenting here, please check your irrefutable factoid against this before trying to make your case. I also think there is a personal responsibility part – we (especially those of us in the rich industrialized world) need to take individual actions to address this real problem. We need to burn less fuel; we need support more sustainable farming practices; we need to stop buying so much disposable junk. But these individual actions will be meaningless without a coordinated government action, and societal shift to support those individual actions. The Montreal Protocol was a good example of how this problem should have been addressed. Less than 15 years after the concept of ozone depletion by long-lived chlorofluorocarbons was proposed (and only a few years after that theoretical effect was demonstrated with a high level of certainty to be actually happening) the world’s governments took action, much to the protestations of DuPont and manufacturers of aerosol cans, and it worked. We have turned the corner on ozone depletion, DuPont still exists, as do aerosol cans. Industry adapted, society shifted, but it took government action. However, those mid-80’s were simpler times. We had those socialist hippies Margaret Thatcher and Ronald Reagan running the free world like a commune, and Russia were our best friends yet. So world governments getting together to legislate an industry-constraining action to prevent life-altering damage to the earth’s atmosphere was a doable thing. Thirty years later, almost all of which have seen the world’s science community increasingly pleading for the world’s governments to do something about a slowly-emerging disaster, the progress on greenhouse gasses has been dismal. If we cannot count on the governments of the largest economies to fix the problem, we need to shift the economy. A couple of years ago, the NWEP held a showing of the Bill McKibbon short film ”Do The Math” that made the case for fossil fuel divestment. If interested, I wrote a long piece about it at the time. The short version: investing in stranded hydrocarbon assets is a bad idea for long-term financial reasons, and for ethical reasons. So back to the question of what we can do. As a municipal government we can shift to greener fleets and more efficient buildings, we can encourage energy efficiency in the community and in our corporate functions. We can encourage a form of development that results in lower GHG production: transit instead of freeways and compact, pedestrian-friendly mixed-use city centres instead of sprawling suburban expanses. We can even ineffectually express concerns about pipelines being built to facilitate the export of bitumen, and try to resist the expansion of thermal coal exports through our ports. But these will not be enough if we are continuing to fight the tide of an economy that does not serve our future. The City can, however, divest from the companies that are pushing that unsustainable future. We can make the choice to not invest our money in the stranded assets that will, if dug out of the ground and burned, diminish the ability of the next generation to prosper. It isn’t just something we can do, it is something we should do. We are also not alone. On Thursday, the City Council in Victoria will debating a motion to divest their assets from fossil fuels, and I suspect it is going to be successful. As is typical these days, Canada is lagging behind the United States on this important environmental and social justice issue, as San Francisco, Seattle, Eugene, Boulder, an many other US Cities Seattle have already committed to fossil-fuel divestment. Divestment does not have to be a sudden move to be effective. Although it represents less than 5% of our GDP, the oil and gas industry is still important to some regions of Canada, and we are going to be using hydrocarbons for the foreseeable future. However, if we agree that we need to continue to improve the quality of life of people on earth, we need to start the transition away from burning of coal, petroleum, and gas for our energy needs right away. We also need to give the industry, and the customers, a chance to adapt to the new reality, while easing the market forces into the right direction. A broadly-supported divestment strategy that rolls out over five or ten years will change the economics of the industry, and allows investment in alternatives, instead of continuing to invest in squeezing the last bit of prosperity out of last Century’s energy sources. Posted on July 18, 2015 . by Patrick Johnstone. 1 Comment. This is the second part of my July 13 report, the first part covered the Public Hearing topics and this one starts with a presentation from the Royal City Farmers Market. You know who they are, but you might not know about all of the things they do aside from bringing a Farmers Market to Tipperary Park every week. They provide a bursary to a NWSS student, they work with the Province to fund a Nutrition Coupon” program to get access to affordable, nutritious food for people who might not have access, they run a shuttle for seniors, they contribute to City festival events – they are a real social enterprise in the City. There are a lot of reason you should support them, buy buying a few groceries every week , and by becoming a member by going to their website here. We then launched into a very long list of Committee of the Whole recommendations from earlier in the day. The City has held a Christmas event of some sort for several years. A Santa Clause Parade has, in the past been the centre of these events, first in the evening (to facilitate a “Parade of Lights”) then in the mid-day (to encourage people to come downtown when businesses were open so they can, hopefully, spend some money at our local businesses). For the last two years, the weather was not great, although sort of what you expect for December in New Westminster: one year it was bitterly cold; the next it rained, hard. Last year, there were a number of indoor “Santa’s Workshop” activities for Kids at the Anvil Centre as well, which increased turnout. The businesses downtown appear to appreciate the increased traffic around the day, and are interested in partnering with the City again. The question is whether the Parade is still necessary, or indeed even a draw. With a good set of coordinated family-friendly Christmas events at the Anvil, the Shops at Westminster Station, the River Market and the Fraser River Discovery Centre, and the coordinated efforts of the BIA and Tourism New Westminster, there is some question whether the effort and expense put into the Parade adds to the event, or if those efforts could be put to use making the other events better. …and I have to say the response was pretty strongly pro-parade, although everyone had a slightly different idea of what they wanted from a Parade ,and people definitely liked the other events. 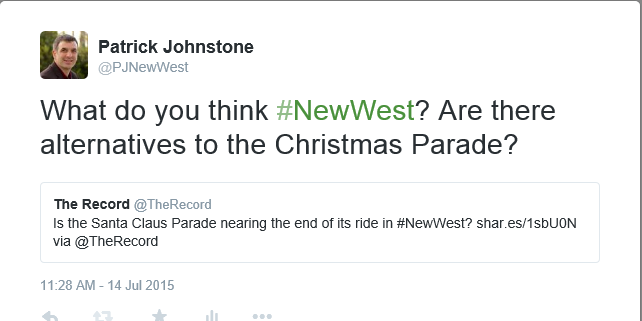 Regardless, the Parade will happen in 2015, as will other Christmas events for the entire family on December 5th. Mark your calendar. We are trying to make Council Meetings operate more efficiently, balancing the need to have open and public discussion of important issues while managing Council and Staff time as best we can. An idea we are launching is something that several other Municipalities already have: a separate “Planning and Land Use Committee” to give a more detailed open discussion of land use and planning topics prior to taking them to the full Council. This will serve both the public and developments by allowing for a more frank discussion of potential issues related to developments coming to Council before they get there. This will hopefully result in less conflict at the Public Hearing stage, by addressing conflict issues earlier in the process, when they are easy to manage. We will be unveiling a Canadian Heritage plaque at the Wait For Me Daddy sculpture in October, in order to complete the requirements for our Federal Grants. Mark your calendars for October 3, 2015. 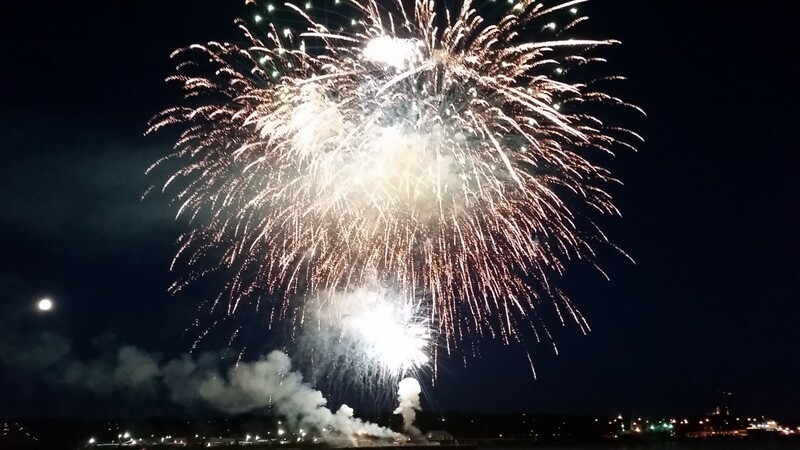 A few organizations have approached the Royal City to partner for a one-day series of events to commemorate the day that Queen Elizabeth’s reign will surpass (at 63 years, 216 days) that of Queen Victoria, and become the longest-serving English Monarch. Mark your calendars for September 9, 2015. Sapperton Green has the potential to be the single largest development in the history of New Westminster. Taking advantage of its location on a SkyTrain station, this project could see 7,500 residents and more than a million square feet of commercial development across a 38-acre site. …a mix of medium to high density residential, office, retail, open space, and public and other community serving facilities in a transit supportive, complete community. The area will support office uses (750,000 sq. ft. floor space minimum to 1,500,000 sq. ft. floor space maximum), residential uses (3,400,000 sq. ft. floor space maximum equating to approximately 3,700 dwelling units and 7,500 residents) and retail commercial uses (approximately 150,000 sq. ft. floor space). Public and/or private community serving facilities will be provided as appropriate. Floor space for non-profit community serving facilities will be excluded from the maximum floor space allowable. A minimum 15 % of the site will be publicly accessible open space, including plazas, squares, parks, playgrounds and other open areas that are accessible to the public. Building heights will range from three storeys to a maximum of 35 storeys. There has been a lot of preliminary work done as far as conceptual planning and community consultation (you can see some of it here), but this is a decades-long project, and we are still a ways from the first shovels entering the ground. More community consultation will be happening this fall, both with the stakeholders required by Sections 879 and 881 of the Local Government Act, and with New Westminster’s’ larger community. Development Bylaw – 900 Carnarvon Street. Also required for the 900 Carnarvon development is a Zoning Amendment Bylaw. The plan is for this Bylaw to be prepared and through two readings before the September 28 Public Hearing. When you can come out and tell us what you think. The Bosa River Sky development was rezoned and is actually selling units as we speak, but they cannot build a building until we give them a building permit. To do that, we need to have a Development Agreement that outlines what off-site engineering works the developer will complete to make their building mesh with the City’s engineering works: water, sewer, sidewalk, gutter, storm water management, etc. This (like pretty much everything else we do in the City) requires a Bylaw. I think I have read more about Benkelman Beam testing in the last few days than anyone not directly involved in the installation of asphalt should. A developer would like to build a commercial building on an undeveloped piece of land in Queensborough, across the street from the Lowes parking lot. The City owns a big chuck of unopened road (40 m wide!) that is in the way of this development. This would meet the City’s land use designation plans for the site, as we generally want employment-oriented land use in this area. There are multiple steps this proposal would go through – we need to appraise the land, determine if the City might need it, consider whether we want to sell it, then go through the entire rezoning, development process with all of the regular public engagement and Bylaw development. At this point, we are just letting staff know if this is even something that Council would consider. And we passed it, so we will. Metro Vancouver is upgrading its sewer infrastructure through the Brunette area, and need to build a new pump station. Like anyone else, they need a Development Permit to build that pump station in the City. As a bonus, this station sits right adjacent to the proposed Brunette Fraser Greenway extension that is part of both New Westminster’s Master Transportation Plan and Metro Vancouver Parks, and will connect Sapperton Landing Park with greenways east. There are a lot of site constraints here, and there is going to need to be a comprehensive plan to enhance the Burnette River setbacks to comply with the spirit of the Riparian Areas Regulation (although, as a utility work, the RAR does not strictly apply, it is important from a sustainability point of view that the City and Metro Vancouver respect the principles and apply them as best we can). This working group is doing good work, looking at programs, incentives, and regulations that the City can adopt to better preserve the Heritage qualities of Queens Park. This report is just an update, as the final report is due at the end of 2015. By all indications (and from the Open House that I attended back in May), this process is going really well, and much credit goes to both our staff and the volunteers from the community who are putting so much energy and creativity into their city. This is a plan to subdivide a 66’ lot into two 33’ lots, to restore and preserve the 1890 house on the lot, and to build second similarly-sized house on the second lot. The City would receive a lane dedication behind the house. This is a preliminary report, and the HRA would require a multi-step process with Public Hearing, but it is an unusual approach for the West End, where these smaller houses are usually replaced with much larger single family homes, often to the chagrin of the neighbours. This is a preliminary report, and staff will proceed with the application process. This is an update to the existing Street and Traffic Bylaw, which regulates parking and road and sidewalk use in the City. the Bylaw was overdue for an update, and has been bounced between committees and up to Council once. I think we have made some pretty good changes, especially (and you saw this coming!) in the areas of encouraging active transportation use in the City. There are still a few things in there I have my doubts about (is “jaywalking” really a thing? ), but I am happy to see this move forward as is. Someday, I will blog about what a failure “Schedule D” is, and how hard it is to make it right. Sale of 323 Fenton Street. There is a residential piece of City land in Queensborough that no-one in the City can imagine using, so we are looking at selling it off. 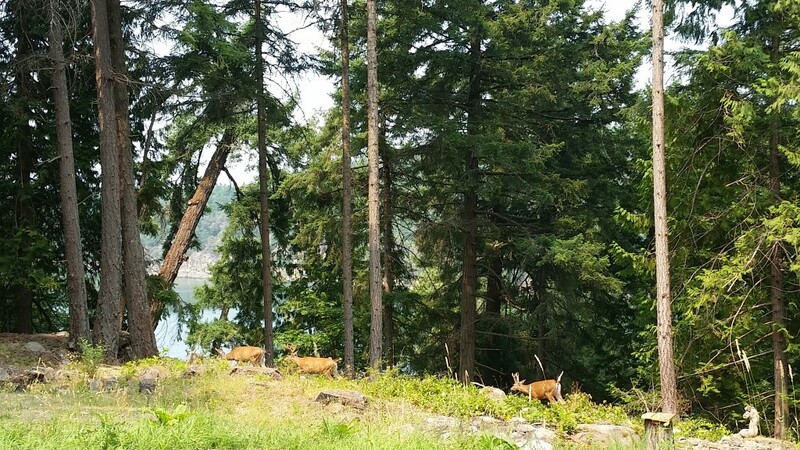 After marketing the land, we received an offer that is fair relative to its assessed value. We agreed to make the sale happen! This is to amend a Bylaw that was adopted in March of 2012(! ), but the land transfer and sale has been delayed, and apparently, we need to change the bylaw because of this delay. There is a bit of a back story here, as the delay by the proponent overlapped a change in standards by the Land Title Office, so the original application is no longer in the format the LTO likes, so we have to go through the entire exercise again. As the delay caused by the delay and the delay are now causing some distress to the landowner, we are going to have a special meeting of Council on August to just move this forward after the legislated Public Notice period is completed. We are here to serve. City response to Regional Water Shortage. This report explains a bit about why City Hall’s front lawn still look greener than most lawns. Actually, more than that, it outlines the numerous ways the City conserves water during Stage 2 restrictions, and how our use is much lower than the maximum permitted under the regulations. 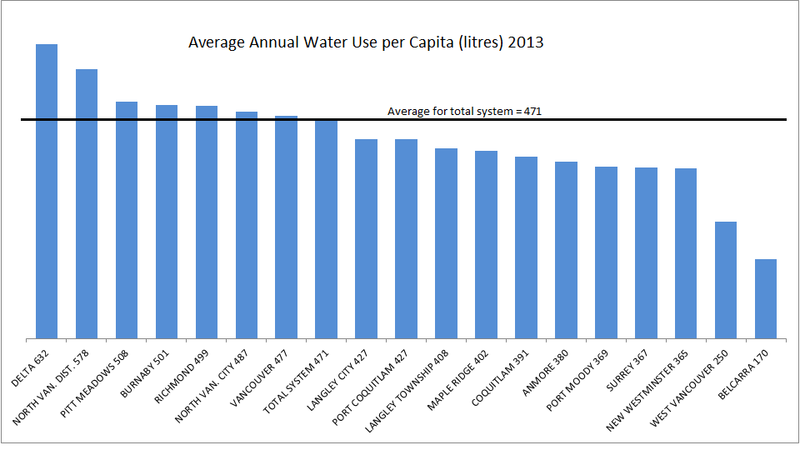 On a per-capita basis, the City of New Westminster is one of the most frugal users of Metro Vancouver water. We are doing pretty well right now, but without a significant change in the weather, we might need to start planning for Stage 3 restrictions this August. More info here. Some properties don’t pay property tax – some of those exemptions are statutory (i.e. regulated by Provincial legislation) like Churches and schools, others are discretionary for Council (Social Service agencies and sports facilities like the Curling Club or Tennis Club). Staff was looking for some guidance about potential changes in policy here, and Council essentially said “steady as she goes”. Every year, the City commissions a public opinion survey from a polling firm as one of the data points for public engagement in the annual budgeting process. We were asked to approve the questions, although major changes are not well advised, as we want to be able to track changes in opinions over time. Council approved the questions that will be asked in 2015. If you get a mysterious phone call asking you about the City’s budget; that would be us. Tell us what you think. If you don’t get the call, there will be other opportunities for public engagement in the Budget process, but look to the city’s Community Engagement Taskforce to present some better ideas about how we can make these consultations more meaningful for the citizens of the City, although some of those will probably not arrive until the next budgeting cycle starting in 2016. 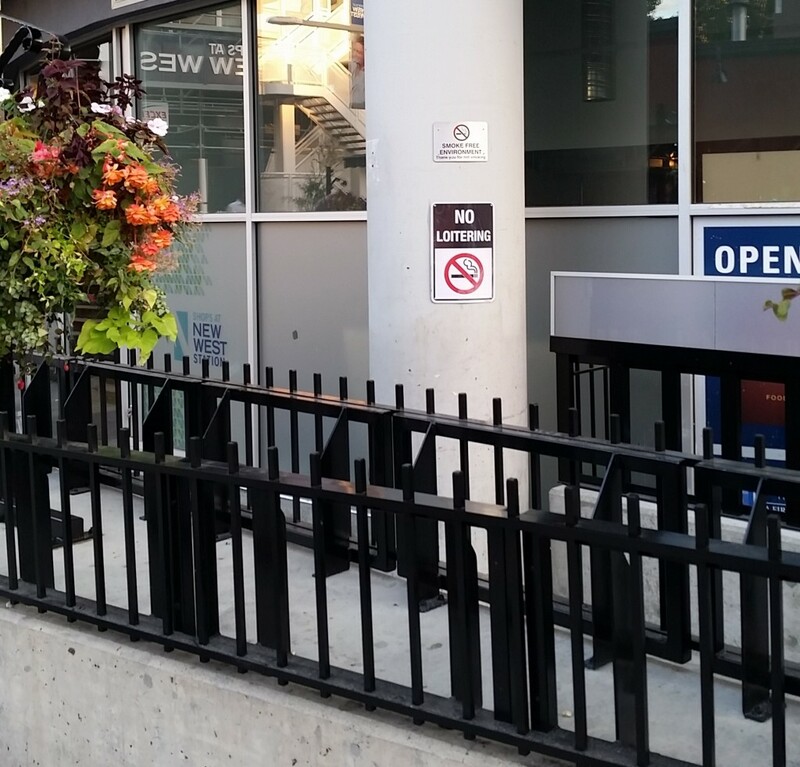 After last week’s rejection of the Public Art installation for the Parkade, Staff recommended another approach, with more information about the selection process and constraints up to here. We should be making a decision about this in the August 31, 2015 meeting. We give a lot of money out in New Westminster through our grant programs. This allows community groups to do many of the things that make the City better to live in, without the City needing to run everything. $685,000 is about $10 per resident, so it is a relative bargain for all the diverse events and programming we get. Staff has been working with the Grantees to make the process easier to navigate, and evaluation more objective and fair. Council always gets “final say”, but the review process needs to be as accessible and transparent as possible. At the same time, we do not want to make the application process too difficult, as it may dissuade many otherwise worthy applicants. Housing Agreement – 900 Carnarvon Street. The proposed fourth building at Plaza 88 is going to Public Hearing in September. For more info on the project, you should go here. The building is planned as a secured rental development, meaning the City needs to create a housing agreement with the Developer to assure the terms of the rentals meet the City’s Rental Housing Strategy, and the building is not converted to “Strata” after the City provides incentives for rentals. Staff will be drafting the Agreement in parallel with continued work on the development, in hopes the terms can be agreed upon before Public Hearing. The City has a Street Activity Program that was developed in 1997 (!) to bring some activity to the streets in retail areas in the City. Given its heritage, the Program was thinking Buskers and Hot Dog Stands. This was expanded slightly in 2009 to include perishable foods (RCFM anyone?) and in 2012 to areas outside of Downtown and add a lottery system to replace the first-come-first-served process. It hasn’t been a hugely successful program, with less than half a dozen licences issued per year, and the Lottery system probably was never required. Further, the system is limited to 7 locations, which staff is recommending we reduce to 5. The lottery system was easy for Council to nix, but the reduced number of locations was not supported. Instead, I suggested we allow the vendors to decide what locations might be appropriate for their type of activity. Perhaps the east entrance to the Anvil Centre, or the entrance to the 4th street overpass, or 6th Ave and 8th street at the entrance to Moody Park is a spot some vendors might find promising. The point is I don’t know as well as the vendors do, so we should give the people who know best what these businesses need the ability to make location choices. I recognize that there are several factors that might not make any specific location appropriate, so we agreed to let staff develop a policy through which selected locations would be considered. On a related note, Food Trucks are the Hot Dog Stands of the new generation. There are a few challenges towards making them viable in the City, and I am of the opinion we shouldn’t be making it tough for them. The StrEAT Food Festival shows this is a trend that is still peaking, but outside of this and other special events, we don’t have Food Trucks operating in the City, simply because our business licencing does not permit it except through day-to-day street occupancy permits, which are a hassle for everyone involved. This proposed pilot project of allowing a Food Truck to set up on City land in front of an accommodating local business (Steel & Oak Brewing) will let staff and the business community iron out any potential problems that may arise. The Food Trucks will need a valid business license in New Westminster, a certificate from Fraser Health, and insurance, and the host business will coordinate their operations. I hope this goes well, and we can expand opportunities for these small businesses in our community. And that, my friends, was a very long Council Agenda for the last meeting of the Summer. We will be back at it the last Monday in August. Posted on July 15, 2015 . by Patrick Johnstone. 1 Comment. Yeah, I am a little late again with this report, but have two good excuses. First, it was a big Council package with much to say (and consequently write). 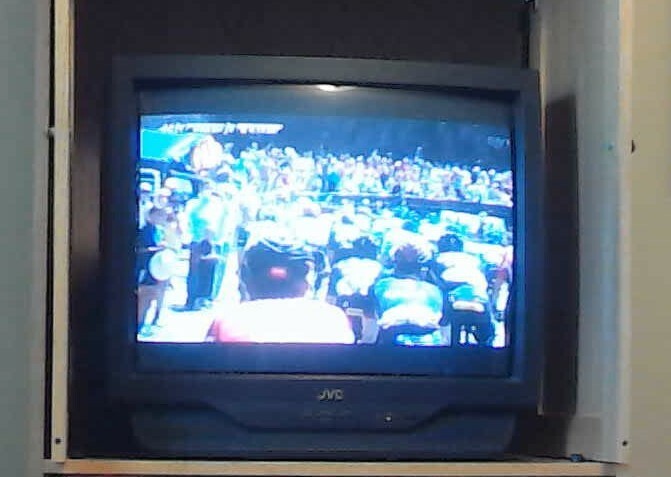 Second, The Tour de France is on, so I am writing this while sitting in front of the TV as I watch the race on PVR. Yes, I am a little distracted. Actual photo from my laptop while I write this. Yes, I need a new TV. So I will break this report in two, talking first about the Public Hearing, and cover the rest of the meeting details in a following post. As is typical for a Public Hearing meeting, we started at 6:00, and invited people to speak on a couple of Bylaws. Zoning Amendment Bylaw No 7767, 2015. A change to clarify the type of single detached zoning that is permitted in a C-3 zoning. We had no correspondence on this Bylaw, and no-one came to the Public Hearing to speak on it. Council moved unanimously to refer to the Council Meeting for Third reading and Adoption. Zoning Amendment Bylaw No 7759, 2015 (210 Durham Street). This was a pretty standard subdivision of an RS-1 lot to two RS-5 lots in Glenbrooke North, to facilitate the building of two houses where there is currently one non-heritage house. We received one piece of correspondence opposing the project, and 5 residents come to speak in opposition for a few different reasons. Although one Councillor telegraphed a lack of support, Council did move unanimously to refer the discussion to the main Council Meeting. The Regular meeting followed the closing of the Public Hearing, and we launched right in to the Bylaws discussed in the Public Hearing. The first was non-controversial and received Third Reading and Adoption – it is now the Law of the Land. The second item was not as well received. The residents who came to speak on the subdivision and development had a variety of concerns. The parking issue always comes up in infill density, and is not a compelling argument on this property, where a single-car garage is being replaced by two 4-car garages and driveways that cover a large portion of the property. Other than simply refusing any type of infill density at all (something that flies in the face of the existing OCP, and does not reflect most of the public conversation around the OCP consultation currently taking place) I cannot see an approach that would include more parking than this. People are going to park on street, just like they do everywhere else in the city, and will fill their garages with other stuff until there is no parking available on the street. The development was also modified significantly from the first iteration taken to the Residents Association to improve the street presence, and the resultant 33’ lots would not be anomalous in the neighbourhood, or even on the block. The changes brought the Advisory Planning Commission into support, mostly around how the street presentation fits the “character” of the street (there is that term again!). The bigger sticking point for me, and one reinforced by residents at the Public Hearing and by a few of my Council colleagues, was the loss of the trees on the back of the property, including one very significant 75’ cedar. The City is working towards an Urban Forest Strategy for this exact reason – neighbourhoods are concerned about the loss of significant trees during infill density. There is no doubt the loss of those trees would have a significant impact on the neighbouring properties, and continued erosion of our urban forest hurts the entire community. I think there were opportunities here to build what the developer wanted while preserving the most significant of those trees, through shifting the position of the garage on one of the new houses and doing a modification of the driveways. however, it became clear that this was not going to be a simple change, and may, in the end, result in some bigger changes in the configuration of buildings on site. Unfortunately, this was more than could be clarified at Public Hearing. As always, I cannot speak about the reasons that other members of Council opposed this development at this stage, I can only tell you my thinking. I also note the developer did not choose to present at the Public Hearing to address the concerns raised by the neighbours, as would have been their right. In the end, Council voted unanimously to not support Third Reading for this project, which means the developer will need to go back to the drawing board. Posted on July 10, 2015 July 9, 2015 . by Patrick Johnstone. Leave a comment. The council meeting of July 6 was held in the smoke-free air conditioned comfort of New Westminster’s Council Chambers! Next week, we have a Public Hearing, so I recommend those looking for a cool place to get a few hours of civic entertainment come and hang out a City Hall! This week we started with cupcakes (not kidding, you will have to watch the video to see), then a special presentation from Ryan Perks, a young New Westminsterite who made a personal commitment to support Honour House, and has been challenging others to match him. You should head over to his Facebook Page and check him out. The kid is a star. The City commonly receives requests for information from the City through the formal process outlined in the Freedom of Information and Protection of Privacy Act. We received 78 requests in 2014, which is fewer than in previous years. Some are from citizens who want to know more about how the City makes decisions than is typically available through our website; some are from insurance companies or lawyers who are managing potential litigation issues; some are from businesses looking to find a competitive advantage. All are treated equally, and in accordance with the Act. The result? In 2014, 5,000 pages of documents were released through FOI, and all were completed within 30 days, unless procedural issues prevented this. Of 78 requests, 6 had to be forwarded to the Provincial Commissioner for clarity or mediation. However, in most cases, the FOI request is actually something the City is routinely able to provide to anyone who asks, so the entire process is straight forward and is dealt with in a couple of hours. The City is also developing an Open Data portal, which should make it easier for people to access this type of information, which will (hopefully) reduce the time and effort required for staff to manage the FOI process. . 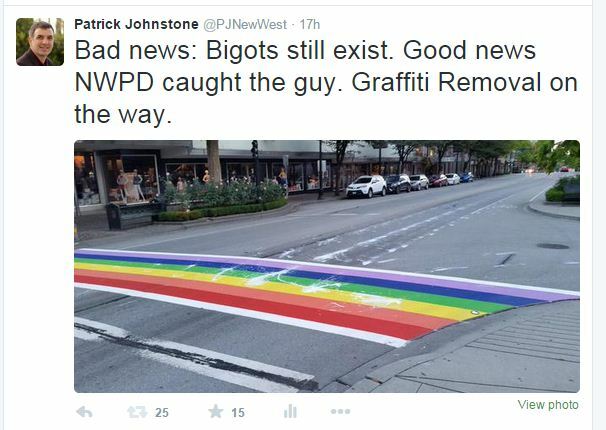 The City spent less than budgeted for the “Vote Yes” campaign in New Westminster. The $20,000 budgeted was to come out of our regular communications and advertising budget. We actually spent a little more than $14,000 of that. 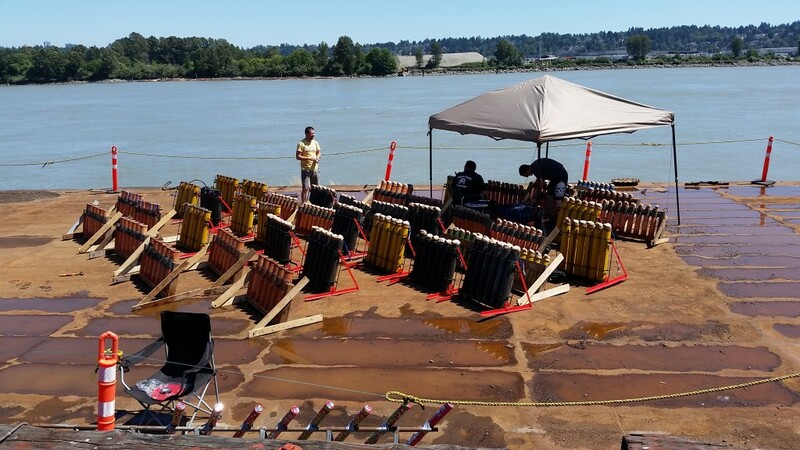 Some question why the City would spend any tax money on this type of activity, and to me it was obvious. The money was found in existing budgets that would normally be used to promote the City’s strategic initiatives or programs. In hindsight, it is easy to say it was wasted because the plebiscite was unsuccessful. However, if successful, the Mayor’s Plan would have provided a quick fill for the gap in funding for the Q2Q bridge, as would matching funds to make all of our bus stops accessible and to increase the bus shelter program across the City. 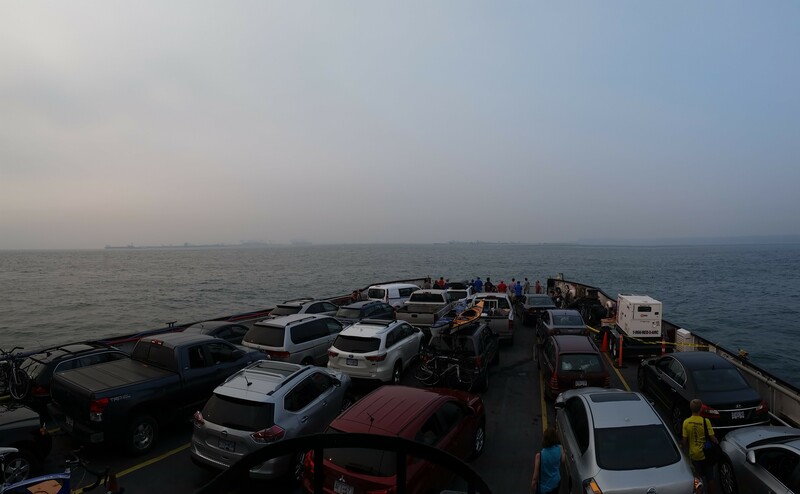 An entire boatload of the City’s strategic transportation initiatives would have become much easier to complete with the Federal and Provincial Government funds that would have come with the plan. And our residents would have more frequent, more reliable transit service while the traffic load on our local roads would be reduced. The combination of benefits the City would have seen would have by orders of magnitude offset the one-time investment of 0.002% of our annual operating budget to help realize those funds. The entire referendum was a dumb idea, but not fighting to secure those funds for the people of New Westminster, who use transit and suffer from traffic congestion more than any other community in the region, would have been idiotic. I wish we had fought harder. I had a little more to say about the Referendum at the Meeting, I will probably write at least one more blog post on this topic, to develop those thoughts. For now, we need to move on. This project is taking another kick at rezoning. The fourth tower at Plaza 88 has a bunch of site constraints making development of it difficult. I am mostly concerned about the pedestrian and traffic realm on Carnarvon. You would not believe how many complaints we get about that 400m of road. It is unattractive, uncomfortable, and IMHO unsafe in the way it is currently operating. I don’t think the solution to Carnarvon will be found in this development, but I want to do everything I can to assure the situation does not get worse, and that we, as a City, find ways to make it better. Council agreed to give this Development Plan First and Second readings next week, and it will be going to Public Hearing on September 28, 2015. C’mon out and tell us what you think. Wow, we have a lot of rental coming on line. There was a long period where there was no purpose-built rental being built, but even new market housing like Plaza 88 has (according to previous report) at least 278 rental suites. These agreements codify the rental use of the new buildings that previously received three readings from Council for this site. They provide the legal framework for the market rental housing proposed, and provide the City security that the property will not be “stratified” after we gave the developer incentives for building rental stock. We agreed to give the Bylaws three readings, and to authorize the completion of agreements. The proposal here is to subdivide two lots in Queensborough into 6 lots. One of the rules in subdivision is that the frontage width of a standard lot can’t be less than 10% of the total perimeter of the lot (hence, a 100’ long rectangular lot must be at least 25’ wide). In this case, the lots are exceptionally long (176’) meaning they would need to be 43’ wide, which is a relatively huge 7,600 sqft lot; Huge by the standards of the neighbourhood, anyway. The request here is to subdivide to 29.33’ lots, which are typical of the neighbourhood and appropriate for the type of development around the subject site, and that requires a variance on the proportional frontage. Council resolved to permit this. This is a bylaw to update the Development Cost Charges Bylaw. DCCs probably deserve another blog post at some point, but the short version is these are the charges per lot or per built square foot that are charged the developer to pay for the increased infrastructure capacity required to support the growth that the development represents. More people (or employment) mean more roads, more sewers, more water, etc. and DCCs allow the City to finance that future need. The formula for determining how much DCC a City can charge is rather restrictive under the Local Government Act, so we don’t have a lot of flexibility in adjusting the rates. We can, however identify how they are applied and what types of infrastructure the charges can be applied. We will be doing a larger, more comprehensive review of our DCC strategy as part of unrolling the new OCP next year. We moved to give this Bylaw first and second readings, and to send it to stakeholder consultation. The refurbished east half of the Parkade is going to have a new façade. The current repairs include upgrading the railings and installing a translucent screen to make the outward appearance more attractive from the Pier Park and the Sky Train bridge. The City’s Public Art Advisory Committee went through an exhaustive yet very fast-tracked process to select an artist and piece that will fit the themes preferred by our public outreach efforts. In a split vote, Council voted to send this proposal back to staff for more information. Some concern about the design was raised by members of council about the look of the piece, and with a bit of a lack of knowledge about the process that staff and our Public Art Advisory Committee went through to get to this point, we asked that staff come back next week with more info. We received three pieces of correspondence. The one that generated a bit of discussion was the update from the Metro Vancouver about our regional water restrictions. The region’s reservoirs are at the lowest range of “normal” for this time of year, at a level that they are usually only seen in August (see graph at top of this page). The bigger concern this year is the one-two punch of our using water at a higher rate than in previous years (1.6 Billion litres per day! ), and with no remaining snowpack and no appreciable rain for more than a month, the streams that normally feed the reservoirs are currently running dry. See the red line on the graph above. Stage 2 Water restrictions mean you can only water your lawn one day a week, and that only early in the morning. There are a series of other restrictions you can see here. I also asked the question about whether the City should have a green front lawn at a time like this, or whether we should allow it to go dormant (“go for the gold”) as a symbolic gesture during this time. We will talk more about this next week, as a recommendation was sent to staff. All were adopted and are now the Law of the Land. Housing Agreement Bylaw No. 7762, 2015 (318 Agnes Street) received three readings. Housing Agreement Bylaw No. 7763, 2015 (328 Agnes Street) received three readings. DCC Amendment Bylaw No 7770, 2015 received two readings. Finally, we addressed the Notice of Motion that Councillor Trentadue raised two meetings ago. The Councillor wants to know why we don’t have more Community Gardens in New Westminster, and whether there is anything the City can do to help facilitate more. This led to a bit of discussion, including the idea of turning an area at the far eastern end of the front lawn at City Hall into community garden space, and a few of the synergies that may come with that location. Anyway, Staff is going to report back on this, and it sounds to me like the members of Council are pretty positive on the idea of more Community Gardens in the City, so hopefully we will make some progress here. And that was the business of the week. Posted on July 6, 2015 . by Patrick Johnstone. 1 Comment. As usual, an update to things I have been doing in the community over the last week. 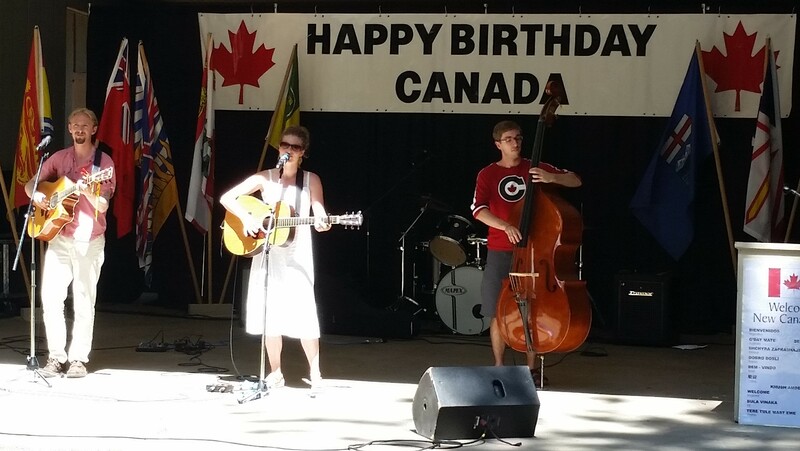 Of course, this was Canada Week: A strange work week with two Mondays, two Fridays, and Canada Day in the middle. 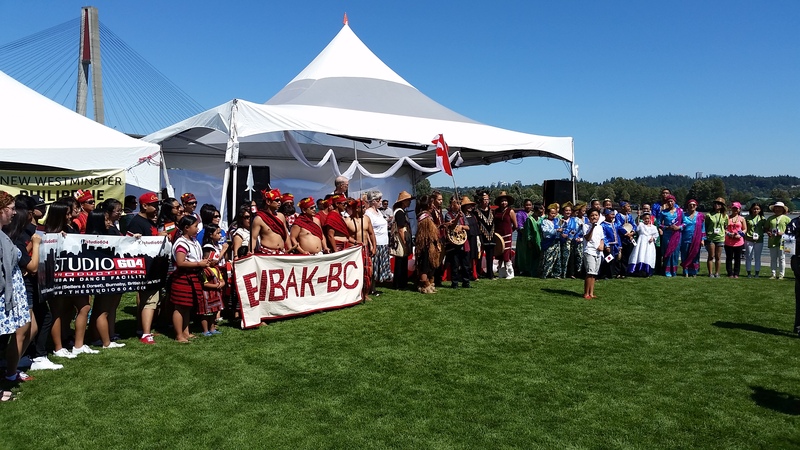 Canada Day in New Westminster was long, hot, and full of events. I really should have left my Strava on to track the miles I covered on my bike during a full day, as I covered most of the streets of town trying to take it all in. Canada Day in the Park is always a fun event, and this was actually my second chance to be on stage during the highlight of everyone’s day – speeches from elected types! However, after all of that excitement, we continued the traditions of cutting the birthday cake, handing out maple cream cookies, and enjoying a picnic in the park. The Spray Park was in full swing, the picnic blankets were out, there were balloons and painted faces, and the tunes were great. 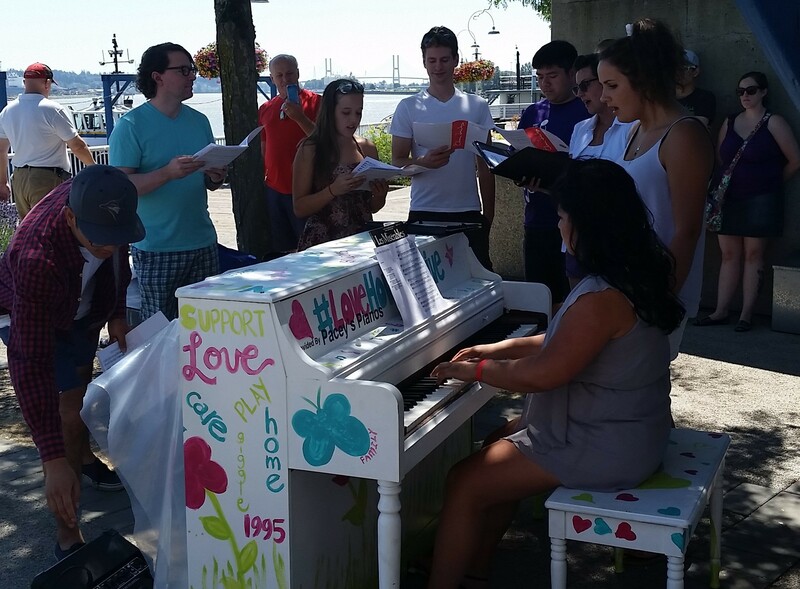 Speaking of great tunes, in the afternoon there was an impromptu performance by the Van Deca Choir christening the newest Pianos on the Street installation at the River Market. This Piano was a fundraising project by Van Deca (who, despite their name, have a pretty strong New Westminster connection), and was decorated by the kids at Canuck Place. It is in tune and will be hanging out on the boardwalk for the summer. If you know how to play, drop by and throw the crowd a tune. If someone is playing a tune, take the time to stop and enjoy! Please, no wagering. After enjoying a few tunes, I joined the crowds down at the Multicultural Festival put on the by the New West Philippine Festival Society, which was probably the biggest event yet held at Pier Park, with great turnout on the grass field to enjoy performances by cultural organizations from around the world – demonstrating the diverse cultures that make up this funny, eccentric, 148-year-old country of ours. 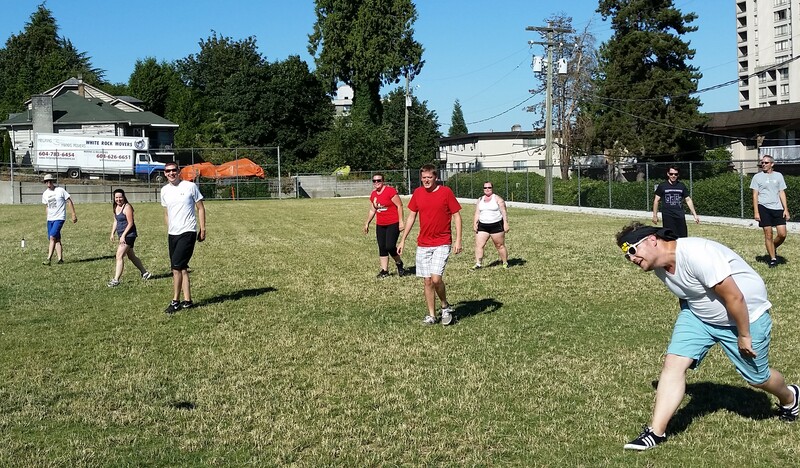 I had enough free time in the afternoon to join a few friends for an impromptu game of Ultimate at Qayqayt field. This is a sport for which I have no talent, as it involves hand-eye coordination and quick reflexes. It didn’t help that the field was just a few degrees cooler than the surface of Venus. Be safe out there folks, living in the middle of a campfire gets pretty old pretty fast. Posted on July 4, 2015 July 3, 2015 . by Patrick Johnstone. 3 Comments. No secret around these parts – I like to ride bicycles more than most people. The last couple of years, my mountain bike has been gathering dust as I spend much more time on the road, in no small part thanks to the guys of the Fraser River Fuggitivi – a rag-tag group of Sunday morning riders, some life-long cyclists, some new to the sport, some fast, some just trying to hang on. On a good day, the FRF can be a dozen riders; on some days we only have three or four; on rainy days we stay home. Them’s the Italian Rules. This past weekend, for reasons that are more complicated than just the serious headwind we experienced on part of the ride, I was thinking about what riding a bicycle has taught me about society. Cycling is not just a social sport, it is a socialist sport. From the Pro Peloton to a local Sunday morning ride, we work together into the inevitable wind. The weaker riders protected by the efforts of the strongest, taking their pulls when they feel able, sitting back when they don’t. Rarely do we judge those who don’t take their pull, we know when you can pull, we know when you are hurting. By working together, we all go faster for less effort. There is nothing more socialist than that. However (and here is the beautiful part), all that working together doesn’t mean there can’t be winners. Individually, few in the FRF could have pulled off our 80+km ride on a hot windy day with the average just a tick under 30km/h like we did on Sunday, but working together we got there and got home sooner. But not before we sprinted our lungs out to see who had the most left in the tank. @Gye_Incognito managed to ride the rest of us off his wheel in that flat-back slightly-too-big-gear style of his (last year’s FRF Sprint Champ @FlyingOakes was not present, and John of the Thundering Thighs is no longer with us, so we will have to put an asterisk next to this win). The sprint was fun as much as it hurt, and there is pride and respect earned for winning it, but none of us would have gotten there together to see it won without the several-hours effort we put in together, pulling together against the wind. Over history, bicycles have been liberating and empowering, and they have been marketed, commercialized and commoditized. They were seen both as a symbol of Maoist communism, then as a roadblock to progress in post-Maoist communism. They were effectively driven off of the streets of our democratic urban areas to foster “free movement” of people and goods, and are now a symbol (arguably, THE symbol) of urban renewal across that same post-industrial capitalist world. Meanwhile, bicycles facilitate a sport that never shies away from its pure capitalist roots – Professional Cycling is a rolling consumer road show that grinds through its workers like a commodity, but where sacred symbols (including the most sacred of all – the Maillot Jaune) are just corporate branding exercises. Still, it is full of traditions that put the team before the individual: with winners who giving their cash awards to their teammates, a culture of Domestiques and Omerta and lead-out-trains and not attacking when your opponent is down. Bicycles are about the most efficient human-powered machines ever invented, but they are also a powerful tool for society. They bring people together for common causes, and make society move forward more efficiently. You can’t help it: cycling makes you a socialist. They also commonly remind me how out of shape I am. Thanks for the pulls, guys. Posted on July 3, 2015 July 3, 2015 . by Patrick Johnstone. 1 Comment. I guess I should expand on that, given a few hours of sober thought. 1: This was the Province’s idea, and Todd Stone’s job was to make it happen. He is the Minister of Transportation for all of the Province, not just those suffering from left-lane bandits and oppressive speed limits. Everything about TransLink is provincial: the make-up of it’s Board, it’s enacting legislation, and the ultimate decision on funding. This is Todd Stone’s file, so if he is not accountable for the loss, who is? Realistically, when was the last time a Cabinet Minister in BC lost their job for not doing their job? Maybe it is time we brought accountability to the government that demands it from everyone else. 2: This Plan would have cost contributed to the local economy $7.5 Billion over the next 10 years, including the matching funds from senior governments and revenue increases related to new infrastructure. By comparison, the current debt load for the Port Mann Bridge is $3.6 Billion, and the traffic counts simply will not agree with those that project would require to pay that debt back. With the proposed tunnel replacement being just as wide, significantly longer, and with much more challenging geotechnical aspects, we can expect the Massey Replacement Bridge to be at least the same cost, for a crossing that sees less traffic than the Port Mann, and whose use is dropping. Having established (and reinforced) that the voters have a right to determine how Billions in transportation infrastructure is financed, clearly we will need to vote on this new $3 Billion + bridge. 3: Pissed off about SkyTrain reliability, accessibility, or even the cleanliness and security of the system? Disappointed because your bus is late again? Getting the bus service in your neighbourhood “optimized”, so now you have no way to get to your shift-work job without leasing a Hyundai? Sick and tired of cars queued up on your surface streets because people living in Maple Ridge or Langley have no viable option but to drive through New Westminster across a rickety old bridge every day? Don’t call your Mayor, don’t call the TransLink Complaints line, don’t write an angry letter to the local newspaper. Instead, contact Jordan Bateman and find out how our new regional leader will solve your troubles through tax cuts. His phone number is 604.999.3319. You could e-mail him at jbateman@taxpayer.com, but really, as a “Taxpayer”, you deserve to get your answers directly from him. Give him a call. Please pull over safely to shoulder before doing so. Don’t scream, don’t swear. Call Jordan. 604-999-3319. He can help. In all seriousness, I thought the result would be closer. Up until the day, I thought 55% NO was the likely result. 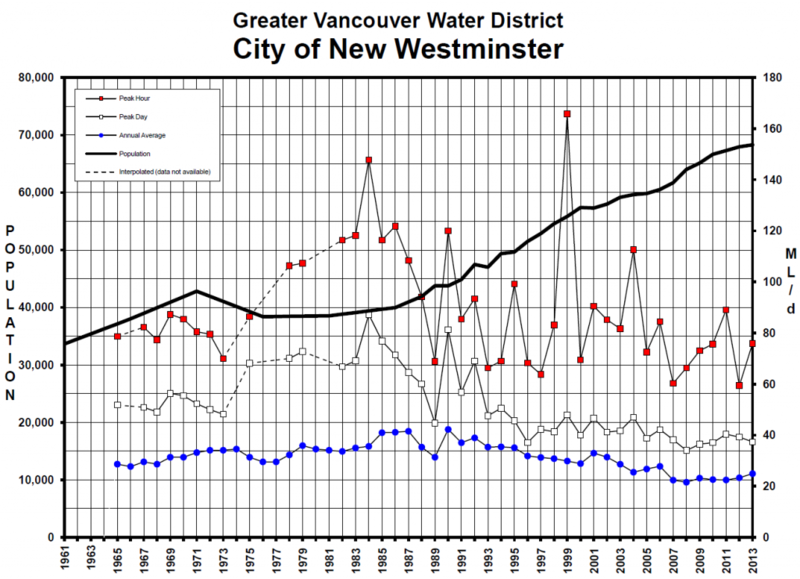 Of course, I expected New Westminster and Vancouver, with their large transit-dependent resident populations and (and just as important, but not as well represented) Transit-dependent businesses, would vote YES in the majority, and Burnaby would be close, only hurt by Mayor Corrigan’s temper-tantrum based approach to the situation. To see Maple Ridge go 25% was not a surprise, even their Mayor did not understand that this referendum was going to benefit them more than most communities, and thought a NO vote would somehow get them more buses. On the flip side, to see Bowen and Belcarra both so strongly Yes was a surprise. Maybe they recognize their single Community Shuttle services were high on the chopping list as the belt tightens on TransLink. Who knows. But it was Richmond that shocked me the most. This City has, over the last 5 years, seen directly how transformative transit investment can be. The Canada Line is overcrowded after only a few years, and if anything is suffering from a lack of capacity and frequency, while a new City Centre of compact livable space booms around it. Semi-suburban office space is becoming vacant as businesses want to move closer to frequent transit. In 2015, Richmond is a Transit Success Story, yet only the comparative transit deserts of Langley and Maple Ridge turned fewer YES votes. It defies logic. It is too early to guess what happens next. I speculated earlier (and only the most cynical parts of that are already coming true. See: Jordan Bateman). But with the Premier not providing any media contact, and the Minister only saying that everyone else has to smarten up, we are entering uncertain territory. I will make one quick comment on a common speculation out there: “Property Tax” will not be the solution. After what we just went through, I cannot imagine a majority of Mayors will come together to agree on a Property Tax formula to raise the $250M/year. Can you imagine the Mayor of West Vancouver (already the highest taxes in the region) agreeing to increase his property taxes to support a plan 56% of his voters said NO to? Or Richmond at 72% NO? Even in Maple Ridge and Langley who have the lowest property values, and therefore would presumably face the least relative burden, while having the most need, there is no Mayor dumb enough to suggest it is time to invest in TransLink. You expect Corrigan to step up now? Calculating a Property Tax formula that is fair, equitable, and provides the stable funding that transit expansion requires is a monumental task. So I would be surprised if a “property tax”-based solution was found any time soon. The Plan included discussion of a comprehensive regional road-pricing initiative. This will be no less complicated, and politically very prickly (which, in our new reality, means that Jordan Bateman is going to hate it – “Taxpayers paying for what they use!? What about the WASTE!”), but in the long run, it is the most logical public policy. Admittedly, I have no idea how we get there from here, though. At best, that is several years off, and in the meantime, expect your property taxes to go up anyway. Roads, parking and congestion cost cities a lot of money. Providing, maintaining, and policing expanded asphalt will only get more expensive. With the regional situation in such flux, it is important that we continue assuring our local roads and sidewalks are as safe, accessible, and efficient as can be. As for the rest… that story has yet to be told.